So it's Wednesday again and here we are sharing our work spaces with anyone who chooses to look, and that is courtesy of the wonderful Julia at her special stamping-ground. Actually looking at from this angle, I stood on a stool to give you a good view, the working area isn't too bad, it is just the other 8 feet of it that is 'disorganized', beyond the BigShot there is another 24" or thereabouts. So working backwards from the BigShot, you can almost see my Woodware Fingerguard cutter, a red box of assorted papers that I take to Craft club on Thursday, alongside that is a Xyron label maker, fabulous for sticking on die cut sentiments, scissors, knife, glue, bits of paper, a congratulations card, and evidence that I did start tidying the mess. 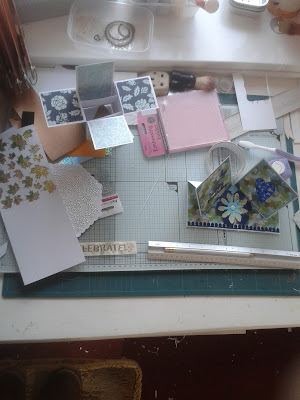 Those bits of blue paper I found when I was putting away some other blue paper and thought 'Oh they look good together, I could make ...... with them' so they are on the desk for the next project. 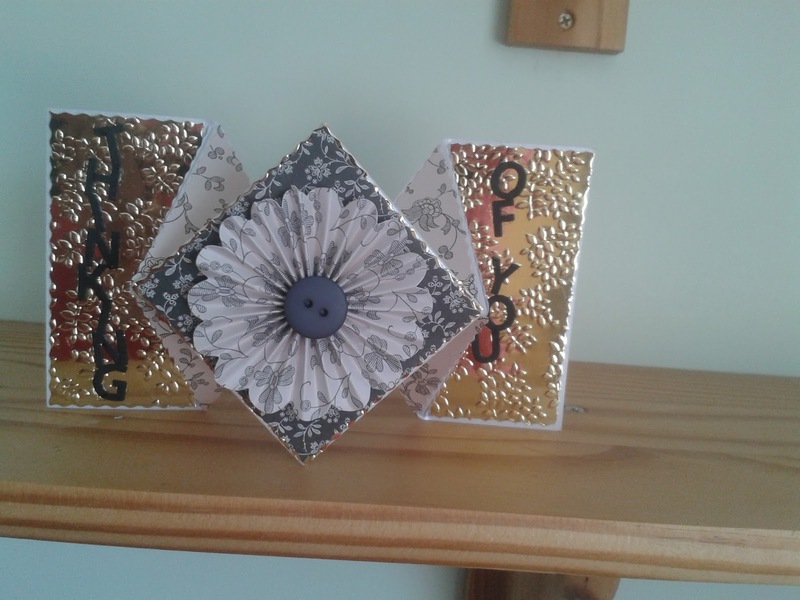 I thought I would give you a clearer view of what is on the mat, a half made box card, a double twisted easel card, an embossing folder, a piece of ribbon saying 'celebrate' and a piece of card with leave on, done through a mask, the day Margaret and I had a play date. And just a couple more cards to show you how busy I have been, this was made because I saw the tutorial and thought 'I have got to have a go at that', really fun, and of course I soon found a use for it. 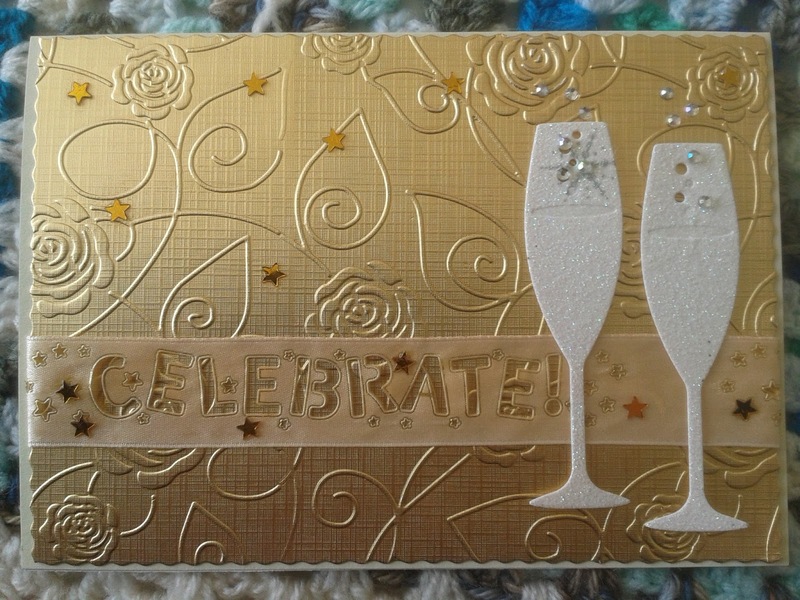 And this was for a club swap, using the other bit of the Celebrate ribbon on the desk. Well I'm off to get dressed, have breakfast and then look at loads of other desks, Thank you for visiting and I will get back to you if you make a comments. Morning Chris. Golly - I know your desk is longer than mine... but I think you have really managed to get lots on there this week. Love the diamond fold card. I had a go, too. Great fun, aren't they?? Have just sent you an email. What a huge expanse of wotkdesk..and all those windows too. Jealous. Haha. I thought you had climbed on top of the work surface to take the photo. Some great projects on the go too. Me again! I used Stylecraft Chunky (from the Wool Warehouse)...it's a budget yarn, but it's so nice to work with with. The crochet grows so quickly too..I'll make all my charity blankets from this in the future as it's much faster than DK! Lovely cards. 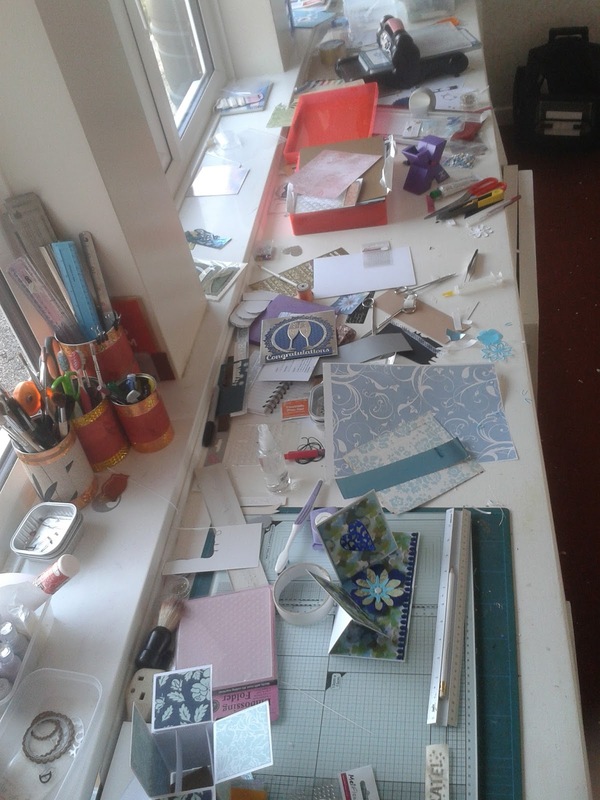 Your desk isn't messy - creative is a better word for it. I like the beginnings of your box card. They look interesting but I haven't tried one yet. Thanks for your visit earlier, I love this mag although it is a bit too arty for me I think. Had to laugh at seeing your post is also a two shot one!!! I love making those box cards, but never made a twisted easel .... maybe I'll have a go at making one. Those gold cards are gorgeous. So working area works, and the rest is for the stuff you need: makes perfect sense for me! Your whole area looks great. Very concerned that you stood on a chair, be careful! Thanks Julia, I did stand on a very secure stool for the picture, nothing wobbly. 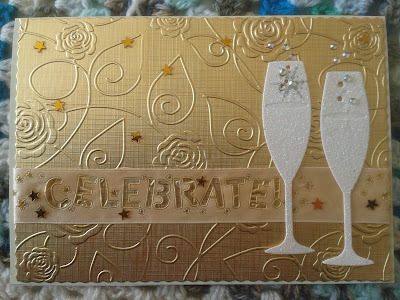 They look great as dies the celebrate card. The ribbon really works well! !